Today's post not only highlights one of my favorite maternity sessions, but shows you a bit more when you choose to do a "Story Session" for your maternity photos. Story Sessions are about an hour long, we can use different looks/spots at a location, different combinations like just mom, mom & dad, mom & children, etc. I suggest maternity sessions be scheduled around the 7-8 month mark so that belly is so cute and mom is still feeling good enough to be moving around and posing. However, don't worry if you're farther along than that! I've had moms that were within 2 weeks of their due date and rocked it! This is one of my favorite locations to do photo sessions at in Western New York, and looking at these photos make me so so anxious for warm summer nights! One question I'm asked all the time, is "What should we wear?" In general, I love seeing a pregnant mom in a dress. Whether it's tight to show off those curves, or a more flowy, boho style to give that ethereal look while the dress blows in the summer wind. Location always plays an important role. This mom's dress was absolutely perfect for the location. It matched the feeling of the tall wispy grass and wildflowers and the color palette was perfect. I've had moms wear very fitted blue or pink dresses at the beach that matched the cotton candy sunset skies....they were absolutely beautiful, but might not have made sense in this field of browns and greens. These are just a few of my favorites from this session, and because there are so many final photos from Story Sessions, the packages include multiple digital files, prints, and even amazing board-page albums as options. 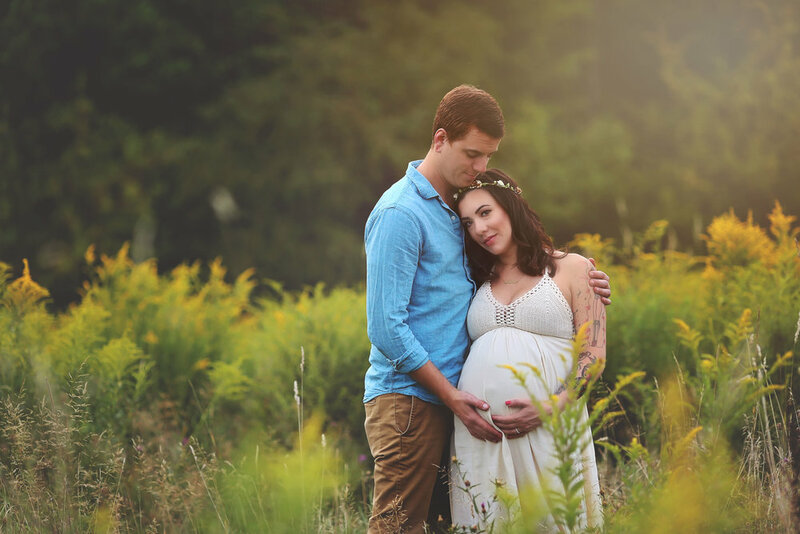 If you are interested in learning more about a maternity session, or a Story Session for your family or children, click be low to contact me or to learn more about the session options. I have faith that spring and summer are right around the corner and cannot wait for another year of amazing families and photos.